When I first saw these, I figured making these would be too time consuming and, well, difficult. The trick is to use the white, yogurt covered pretzels which are then just “glued together” and decorated. Sort of like a craft project combined with a cupcake making project. 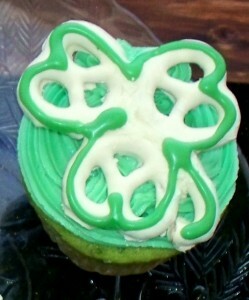 It might be fun to get the kids involved in the decorating, too, but don’t tell them there is spinach in the cupcakes. That will be our secret. Well, ours and From Apples to Zucchini.